The Oscar winner ("The Lion King") combined traditional Japanese instruments (koto strings, shakuhachi pipes, taiko drums) with unconventional Western orchestra (just strings and brass) and synthesizers for a massive West-meets-East approach to the story of a Civil War hero in 19th-century Japan. "Japanese music of the 1870s is completely inaccessible to most Western audiences. It would not work dramatically. In fact, it's the antithesis of drama." So he decided to use Western melodies, but try to apply a Japanese aesthetic to them. Also, he notes, there are vast stretches of images and music, with no dialogue. "Musically, we go through a big metamorphosis," he adds, just as Tom Cruise's character changes from a drunken, cynical American soldier into a respected samurai. "I track him all the way through basically by giving the other (Japanese) characters more and more weight, musically. I wanted the American to find a home, to find peace, in Japan." Moving to London, Hans began composing jingles for Air Edel Associates and teamed up with Trevor Horn and Geoff Downes as "The Buggles" to produce the worldwide hit, Video Killed the Radio Star and subsequent album The Age of Plastic. By 1980 Hans was pioneering the use of computers live on stage while working with the group Ultravox. Then he enjoyed a period of stardom in Italy with the avant garde band Krisma, before returning to London to develop his next project with Warren Cann of Ultravox, culminating in a series of unique concerts at the London Planetarium. It was shortly after this that Hans met and began working with the film composer Stanely Myers. Realizing the importance of incorporating the two musical forms, electronic and classical, they set up "Lillie Yard Studio" in London with the very latest state of the art musical technology. Zimmer continued to work out of "Lille Yard Studio" as his partnership with Myers strengthened. They worked very successfully on Jerzy Skolimovshi's Moonlighting, Success Is The Best Revenge and The Lightship; Nicholas Roeg's Insignificance and The Castaway. They then went on the compose the music for the box office hit My Beautiful Launderette (Best Picture Evening Standard Awards). In 1986 he worked solo on Working Title's Vardo and he then went on to work with Ryuichi Sakamoto, and David Byrne, to produce the soundtrack for the award winning epic The Last Emperor. This was followed by another teaming with Stanely Myers for the score of Nature and the Beast. He then wrote scores for Philip Saville's Wonderland, and Paperhouse for director Bernard Rose at Working Title. Then for Vestron he composed the music for the Faye Dunaway, Klaus Maria Brandauer feature Burning Secret. In 1988 he was asked to compose the music for a small budget, ground breaking film about South Africa, A World Apart. Based on a true story, this film was not just a coming of age of the voice of the struggle, but a turning point in Hans' career. As a result he was asked to write the Oscar nominated score for the box office smash Rain Man. Through 1989 Hans scored Ridley Scott's Black Rain and then his third Oscar contender, Driving Miss Daisy. He followed this with the score for the Universal release Bird on a Wire, Paramount's race car drama Days of Thunder starring Tom Cruise, Fox's thriller Pacific Heights, allowing Hans to work with Oscar winning director John Schlesinger. In 1991 Hans completed the scores for Peter Weir's GreenCard (Golden Globe Best Comedy), Ridley Scott's Thelma & Louise, Ron Howards fireman epic, Backdraft, Richard Donner's film Radio Flyer, and Franc Roddman's mountaineering thriller, K-2. 1992 began with Hans working on his second south African film, The Power of One for director John Avildsen. The epic scope of this movie allowed Hans a unique opportunity to write both songs and music with a South African lyricist to create haunting tribal anthems to support the historic struggle of the film. Hans then went to work with Penny Marshall on A League of Their Own about the first all woman baseball league, starring, Geena Davis, Tom Hanks and Madonna. Hans finished up 1992 working with Barry Levingson on Toys starring Robin Williams. The most popular music from that film, however, was ultimately the songs contributed by Enya. 1993 started with scoring the American version on La Femme Nikita and Point of No Return starring Bridget Fonda. This was Hans' second collaboration with director John Badham. Hans then worked with director Percy Adlon of his film "Younger and Younger, reteamed with executive producer Penny Marshall for Calendar Girl and also with Tony Scott, who directed Days of Thunder for the Quentin Tarentino story of True Romance. Hans' score for the Disney surprise hit Cool Runnings did blistering business at both the box office and in the charts. Hans' next release was the criticaly acclaimed I'll Do Anything written and directed by James L. Brooks, starring Nick Nolte. Hans also composed the original score to Bille Augusts' House of The Spirits which is doing amazing buisiness in Europe. 1995 efforts included such films as Nine Months (for which Hans wrote the theme before production started) and Something to Talk About. Two enormously popular soundtracks were released in 1995. The score for John Boorman's Beyond Rangoon combines ethnic pipes and voice with synthesizer. Later in the year, the submarine thriller Crimson Tide was a huge success at the box office and Zimmer received high praise for his choral, action-packed score. In 1996, he wrote a wealth of material for seven films, beginning with John Woo's Broken Arrow. This gave Hans the chance to score a western (sort of) --he had originally wanted to score Clint Eastwood's Unforgiven. Next, he scored the summer hit The Rock with Harry Gregson-Williams and a short recording for The Fan. His score for The Preacher's Wife (unreleased as of 1999) was nominated for an Academy Award. He continued with what he considers his best score: Two Deaths. Other releases of the year included The Whole Wide World and Muppet Treasure Island. The most classical of his works, Smilla's Sense of Snow was scored in early 1997. Next for Hans was Old Friends and The Peacemaker. Zimmer has composed the music for over 70 feature films. In addition to his composing work, Zimmer heads DreamWorks' film music division. His appointment marks the first time that a composer has headed the music department of a major studio since the days of Dimitri Tiomkin at MGM and Alfred Newman at Twentieth Century Fox. Scream 2 (piece from Broken Arrow). Song Writer: "Brothers", "Secure"
Aspen Extreme Song writer "The Driver - Part 2"
Hans Zimmer: A score is the most orchestral sound that underlies the film. The music is specially written for the film. In most cases, a pure score-CD is released of a film. Although often there is only a CD with songs. Sometimes, a mixed CD, with both score and songs, is put on the market. 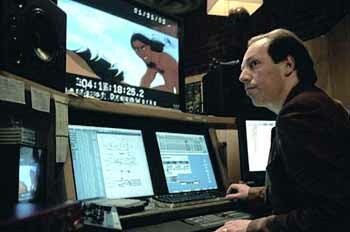 Hans Zimmer: For years, Hans Zimmer has been one of the most successful composers of filmmusic in Hollywood. Born in Frankfurt am Main, he started his career in England, where he worked with composer Stanley Meyers. After some co-compositions for Meyers, soon commissions followed for projects of his own.After this came his move to Hollywood and he finally broke through with his music for Oscar-winner Rain Man. Hans Zimmer: Before Hans Zimmer became active in filmmusic, he was a member of the 1980s band The Buggles, that scored a hit with their Video Killed The Radio Star, in 1979. If you would dig up an old TV-performance, you can recognize Hans Zimmer behind the synthesizer. 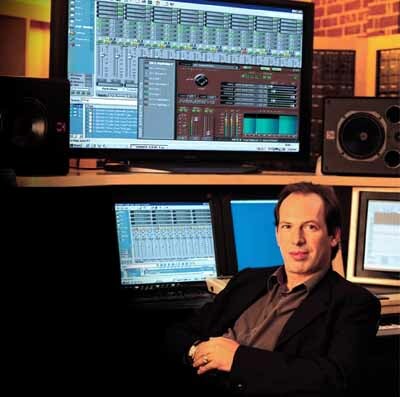 Hans Zimmer: Media Ventures is the L.A. based music-studio of Hans Zimmer and his partner, Jay Rifkin. Zimmer himself described MV as School of Sounds. Zimmer founded the firm to give young, talented composers a career-start in Hollywood. Hans Zimmer: These composers are or were colleagues in the soundfactory of Zimmers Media Ventures. Zimmer works closely with his people on a whole range of different projects. Harry Gregson-Williams for instance, conducts numerous Zimmer-scores. Nick Glennie-Smith wrote shorter passages for Zimmers Nine Months, Hans Zimmer on the other hand produced for example the score for Jeff Ronas White Squall or John Powells Face/Off. Some co-productions are not even accounted for by a credit. Which modular system did you start off with ? Hans Zimmer: The Roland System 700. It's pretty much on every movie that I ever did in England such as 'Thelma and Louise'. Part of it just got used as the greatest auto-panner in the world!! Because with film stuff, when you put things out of phase they go to the back, so I'd make these really elaborate patches up, and put half the mix through it and it would throw it to the back and round to the front and delay one side... all that sort of stuff. Like real kids stuff, great fun!!! Did you ever use any modular synths live and what sort of problems did they create? The system 700 and Moog went on tour. At the Old Vic in London they have a revolving stage which is on a slant, and if anybody hits the revolve switch by accident, everything starts falling towards you - which is pretty frightening. Also we played at the "Reading Festival". We had played warm up gigs at the Marquee using the Roland Micro-composer which would start everything off. Nobody would ever count the bars, rather just look over and say "oh bar 16 we are in on bar 17" - but at Reading, the sun was blazing down so nobody could see the display and we all realised it too late. We all came in like 2 bars late, the sequencer playing absolutely the right thing and all of us 2 bars late!! Of course we never caught up!!! I just looked over at Warren Caan (Ultravox drummer) and shrugged my shoulders and he went "switch the f**ker off!!!" Which modulars do you use right now? Hans Zimmer: I have the Roland System 100M. I have the Jupiters and all that sort of stuff - a Yamaha CS 80 with midi. I also like the Roland JD 800 and 990's but I'm afraid the D50 has been switched off for an awfully long time, and I don't think it is going to be switched on again in a great hurry!!! What's an example of something that can go wrong that would make you have a bad day? Hans Zimmer: Writing a tune that you think is really good, and then come in the next day and you realize it's completely ghastly. You just have to throw it out and start again. Actually that is not so bad as sitting there and just not coming up with ideas. And there are days like that. There are more days without the ideas than there are days with ideas. Your film music career is then your dream job, exactly what you want to do. Hans Zimmer: Absolutely. Whenever other interesting things come along, and they do come along, I get sidetracked for 10 seconds. It is surprising what happens when I sit back in this room. I have a great time writing. It is more satisfying than anything else. You just want to shut the world out and be completely selfish, and just write. Most of your music have electronic elements in them. Hans Zimmer: Yeah, that is where I come from. Maybe I am not smart enough to separate orchestra or electronics. I just think if it makes a noise, use it. A lot of my stuff has fun sounds as well, a lot of percussion, etc. Anything that makes noise is allowed to be in the score. Do you ever miss living in Germany? Hans Zimmer: Noooo. I am a gypsy. Wherever I can do music, I am happy. So you know, it is beside the point where I am. There are composers who work from Europe in Hollywood, but I just need to be where the film is. So wherever the film is, I am going to be, because I actually need to go to the cutting room and ask dumb questions. See everybody else's process and be involved. Since you have traveled so much, where do you think is the most beautiful place on earth? Hans Zimmer: Australia. I've spent quite a bit of time down there. In fact I was down there recently, a couple of times again. There is something about the people and the lifestyle, it is just a gorgeous place. I think, if I could, I would move to Sydney. The problem is that it is so far away. Recently I flew from Sydney to Europe, and it was a 28 hour flight. But because it is so far away, you still do feel you get creative, unspoiled ideas down there. And a different way of working, and a different way of looking at things. From what I have seen, I just really like the lifestyle and the people. I've always had an interesting time there.